The RBC7000 Single Station, Battery Operated Timer mounted on a 3/4 in. inline valve has joined DIG’s innovative and rugged line of battery operated timer’s ideal for use in residential and commercial applications or where AC power is unavailable. Outfitted with the latest and most efficient electronic management technology, the RBC 7000 can operate up to three years on two AA alkaline batteries. The RBC7000 features a large, easy-to-read LCD screen and simple, icon-based programming with weekly or cyclical programs. The timer’s 3/4 in. 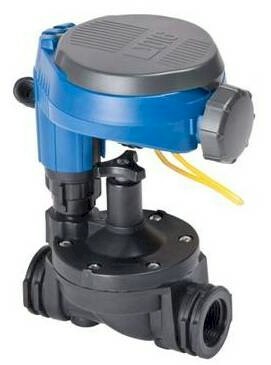 professional grade inline valve includes flow control, and two adapters to convert the inline valve with pipe thread into hose thread allowing for outdoor faucet connections. Completely waterproof and able to operate in harsh environments, the RBC7000 is the simple and dependable solution for drip irrigation and sprinkler systems above or below grade. o In weekly schedule, the timer can be programmed to operate on any day of the week such as Monday, Wednesday, and Friday. o In cyclical schedule, the timer can be programmed to operate on odd days, even days, or on any day such as every three days. Up to four start times per day in weekly or cyclical schedules provides added flexibility for any type of watering application, including sandy or clay soil.